HALIFAX-A secret location along Nova Scotia’s southwest coast has been shortlisted as a potential site for the world’s first retirement home for whales and dolphins raised in captivity. The pioneering effort started two years ago when the U.S.-based Whale Sanctuary Project announced it was looking at sites across North America to establish a large seaside enclosure. Marino confirmed this week that the list of potential sites has been narrowed to two locations: Nova Scotia and Washington state, with a couple sites in British Columbia as backup options. Talks are ongoing with government officials, local residents, fishermen and First Nations, but the group has yet to submit a formal proposal to Canadian or U.S. officials. The group plans to make a decision before the end of the year, and the goal is to have a 28-hectare sanctuary, about the size of 40 soccer fields, operating by 2020. About $2 million has been raised for the $20-million project. A fundraising drive is expected to begin soon. “There’s so much distaste for keeping these animals in tanks and asking them to perform for their supper,” said Marino, a neuroscientist and expert in animal behaviour who has studied marine mammals for 25 years. Public attitudes toward keeping the highly intelligent and socially complex animals in captivity have changed as researchers have learned more about their lives. “There’s so much scientific evidence that their welfare was very poor,” Marino said, adding that the 2013 documentary “Blackfish” helped expose the darker side of the marine mammal entertainment industry by focusing on Tilikum, an orca involved in the deaths of three people. In January, the Vancouver Aquarium announced it would no longer keep whales and dolphins in captivity, saying the heated public debate over the issue was getting in the way of its conservation work. Last month, hundreds of protesters gathered outside the Marineland adventure park in Niagara Falls, Ont., where dozens of beluga whales and dolphins are part of the show. The park is home to Canada’s lone captive killer whale, Kiska. In 2015, Ontario became the first province to ban the buying, selling and breeding of orcas. 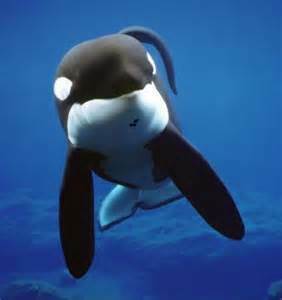 The following year, industry leader Seaworld Parks and Entertainment announced it would stop breeding orcas in captivity. And in Ottawa, a bill tabled in the Senate would prohibit whales and dolphins from being kept in captivity. However, whales and dolphins raised in captivity can’t be returned to the wild because they don’t have the necessary survival skills. Renowned marine biologist Hal Whitehead, a professor at Dalhousie University in Halifax, is among the Whale Sanctuary Project’s many international advisers. 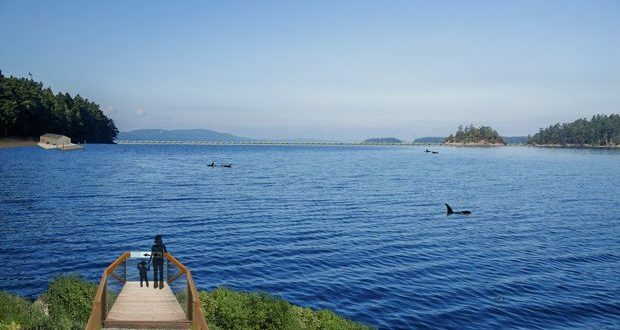 Critics have said the sanctuary plan is flawed because it will be difficult to contain orcas that can weigh as much as 5,400 kilograms. As well, they say marine mammals raised in captivity can carry pathogens that could infect wild populations. 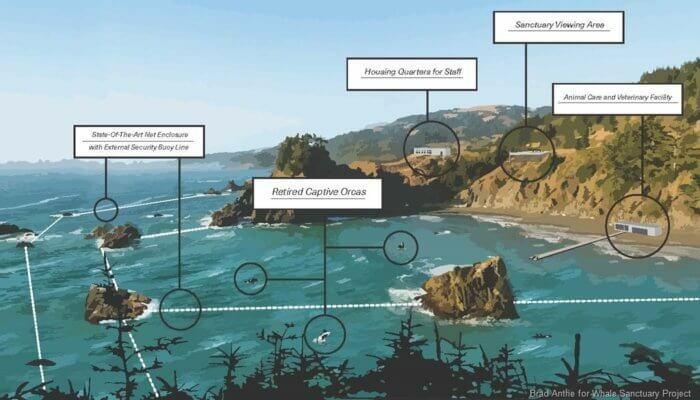 Whitehead said those behind the project plan to erect two nets to keep the whales in, and he stressed that monitoring by veterinarians will reduce the risk of illness. Marino says her group’s panel of advisers has extensive experience with holding nets, and she stressed that the locations selected will be protected from the open ocean.